You'll never get her to change her mind. Sometimes you meet an immovable force. When you encounter such a person or situation, the most efficient use of your time is to figure some other way to reach your goal, because this path is closed to you. 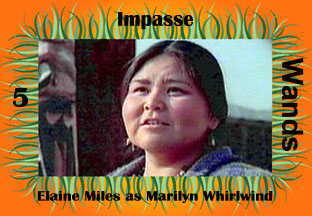 Northern Exposure's Dr. Joel Fleischman faces a lot of impasses in Cicely, but none are as firmly unmovable as Marilyn. Once she sets her mind to something, no one's wishes--not even her own--can change it. Her name is Whirlwind, but she's really the eye of the storm: serene, quiet, and utterly impossible to swerve.